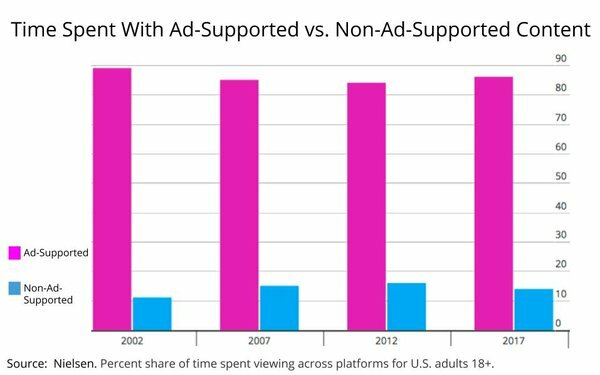 Recently, Research Intelligencer reported on new estimates from PQ Media tracking the share of time spent with ad-supported media vs. non-ad-supported media overall. Today, Nielsen released its own proprietary estimates tracking the share of time spent by the average American adult consuming ad-supported vs. non-ad-supported content, across all platforms Nielsen measures, including TV, radio, smartphones, video games and tablets. The share of time spent with ad-supported content in Nielsen’s universe has been trending downward, albeit not as dramatically as the overall media universe tracked by PQ Media. The stability may be surprising given the rapid adoption of ad-supported alternatives, such as over-the-top television. Note eMarketer’s release today of revised downward projections for TV ad spending, which it attributed largely to the shift to OTT vs. linear ad-supported TV. Confused? Like many of the studies reported on by Research Intelligencer, shares and trend lines have as much to do with the size and composition of the media universe being measured as it has to do with the method used to measure them. Always read source lines and footnotes. So at least in the case of Nielsen’s universe, American media consumption appears to be relatively stable. “Consider this,” Nielsen’s report concludes, “in second-quarter 2007, the average amount of time spent with media among adults was just over 50 hours per week. 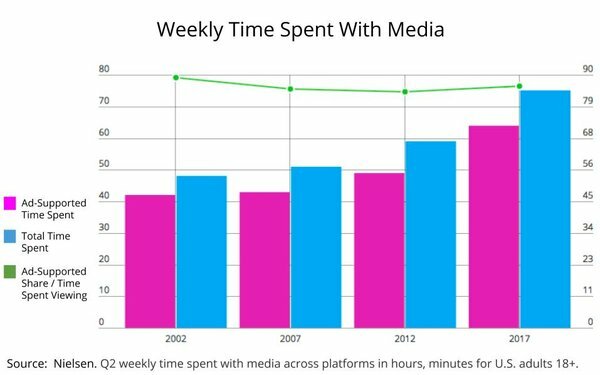 In second-quarter 2017, that number increased to over 75 hours per week, nearly 65 hours of which are spent with ad-supported platforms. Since second-quarter 2012, the average amount of time spent with ad-supported TV, radio, and digital platforms has grown by over 15 hours — an increase of 30% to 2017. When looking as far back as second-quarter 2002, that same number exceeds 20 hours. 1 comment about "Time Spent In The Nielsen Universe: Ad-Supported Vs. Non-Ad-Supported". Ed Papazian from Media Dynamics Inc, March 29, 2018 at 11:17 a.m.
Also to be considered, Joe, are the relative degree of commercialization that characterizes each platform and the proportion of ad "placements" that actually reach the viewer's screen and show a commercial from start to finish.Last but not least is the CPM pricing aspect, which determines how much "audience" an advertiser gets for the amount spent. While some TV sellers are testing the waters with small reductions in ad clutter to see if they can garner much higher CPMs in return, digital ad sellers are having severe "ad viewability" issues and advertisers with TV experience are insisting on much tighter audience metrics. All of these factors meld together with others---changing business plans, shorter commercial lengths, new targeting and time buying methods, etc.-- to govern the outcome. Time spent, alone, is merely the tip of the proverbial iceberg.